The sun cat, as it is most commonly but certainly not exclusively referred to, has become one of those sometime seen species in the past seven or eight years. It is within the lifetime of the forum of this site that we saw its initial regular introduction around 2005 replaced by a significant influx of farm raised fish and now it appears to have settled into that aforementioned “sometimes seen” category of catfish available for sale. Back in 2001, I introduced Horabagrus brachysoma’s sister species, H. nigricollaris. Since then there appears to be a move towards agreement that these two species belong in a catfish family of their own having some differences from the Bagridae family from whence they came. Both species hail from Kerala, India. In the aquarium these are hardy and robust fish that grow quite large but not unmanageably so. Typically they are offered for sale at around 3-4” (7.5 — 10cm) standard length size but sometimes you will encounter a large individual which is often the result of inadequate research on the part of the fishes previous owner. As catfish go they are not especially fast growers but you can expect them to grow several centimetres a year from the small size they are typically offered for sale at. The fish itself is an attractive golden to olive green body with nice black markings on the fins, the remainder of which can colour up to a nice translucent red colour. 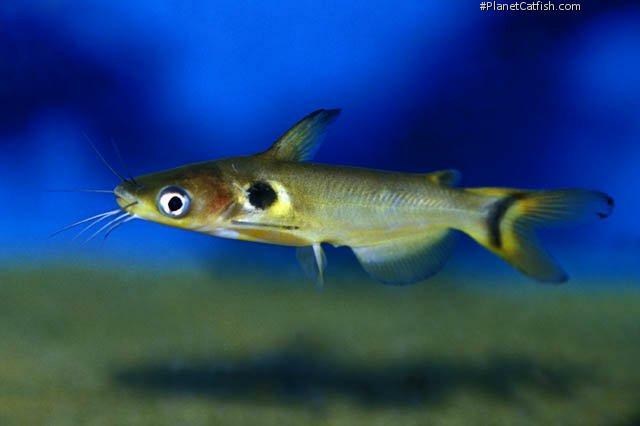 Its stand-out feature, giving rise to its eclipse catfish common name is a roughly round disc of black surrounded by a circle of white behind and slightly above the fishes gills. This gives the head of the fish an attractive look and is really rather unusual. In terms of temperament, reports differ. Some keepers will swear this is a fairly sociable species that will share a cave or similar refuge with its own kind or other catfish. Others report a territorial bully that will bite and nip fishes away from its lair. Perhaps this is to do with how the fishes are raised (together or alone) and perhaps this is also a gender thing. The one “nasty” Horabagrus I actually had the opportunity to have a good look at was an 8” (20cm) adult male. It would not seem unreasonable to purchase a group of three or four youngsters, provide them with a couple of caves each and see what happens. If needed, the group can be thinned out over time, but I suspect their rearing together will help keep the peace. Although reproduction in the home aquarium is, to my knowledge, not documented. Fish farm breeders in the US, Indoneisa and perhaps elsewhere produce these fishes en masse for the ornamental fish trade using egg striping and artificial fertilisation techniques. Naturally, the species is an egg scatterer and, as such, produces thousands of small eggs presumably in sluggish vegetation dense side waters. The artificial technique produces an equally high number of viable eggs and young are comparatively simple to raise to saleable size. Adult males have obvious genital papillae and females are nearly twice the girth of the slender and more brightly coloured up males. They are peaceful catfish; even a boisterous individual will not harm the free swimming inhabitants of its tank. It is a slower water, heavily vegetated reasonably main river predator and will eat small fishes but even a 8” (20cm) well fed adult is safe with fishes down to about 2” (5cm) in size. It is, therefore, an ideal fish to keep with medium to large sized barbs and larger Rasbora and perhaps some Crossocheilus or Sewellia to keep activity, colour and intrigue well served in the one tank. However, if you’re not as fussy about keeping your fishes together in groups of animals that would naturally find similar species together in the wild then this catfish would be a good addition to a medium sized cichlid or indeed rainbowfish tank.